If you’ve been wanting to give The Cleaners a try, here are two great ways to get started, especially if you enjoy ebooks. 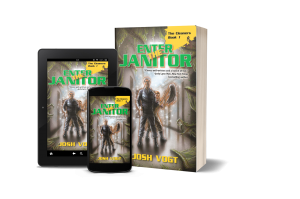 First, Enter the Janitor is just $.99 on Amazon, making it super-cheap to snag a copy and start reading. The Maids of Wrath and The Dustpan Cometh are also slightly discounted, so you could get the whole series at once for less than $10. Sign up to my newsletter, The Inbox Imp, either here through my author site or via the Story Strong Press signup page. Already a newsletter subscriber and still want Book #1 in the ebook format of your choice? Just contact me and we’ll make that happen. And, if you’ve read it and enjoyed the story thus far, would you be willing to run by Amazon and leave a review? It’s one of the best ways to thank any author for their hard work. Previous Post Cover Art for Fellowship of the Squeegee!